This is the kind of tantalizing data I mentioned the other day in a search for some kind of connection, link, or correlation between socioeconomic status and choice of reading platforms: print or digital. 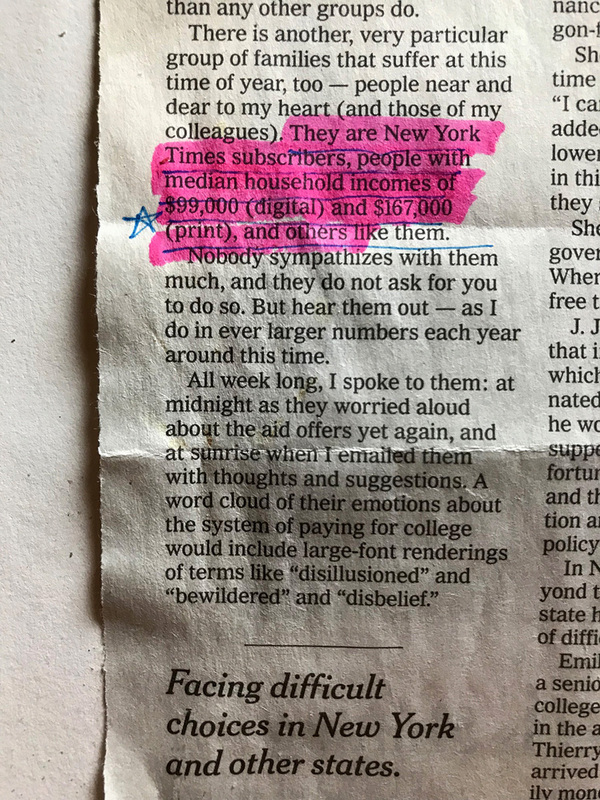 This example was especially compelling, because it appears in an article about something else: “As College Deadlines Near, Families Wonder What They Can Pay” — Lieber, Business, April 28, 2017. The data is most likely the result of internal Times research and therefore proprietary and unavailable to us. Sociological research on reading, which formerly focused on literacy, now conceptualizes reading as a social practice. This review examines the current state of knowledge on (a) who reads, i.e., the demographic characteristics of readers; (b) how they read, i.e., reading as a form of social practice; (c) how reading relates to electronic media, especially television and the Internet; and (d) the future of reading. We conclude that a reading class is emerging, restricted in size but disproportionate in influence, and that the Internet is facilitating this development.